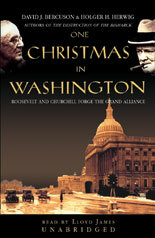 One Christmas in Washington is the fascinating, in-depth look at the Washington war conference of 1941, as two proud and accomplished statesmen struggled to overcome biases, suspicion, and hubris to create what turned out to be the war-winning alliance. The authors take a penetrating look at the high-level meetings and at the scenes behind the scenes. As with any momentous gathering of world leaders, there was high politics and low gossip, and both contributed to earth-shaking events of this momentous time. This was so boring it felt like a whole year in Washington. If this was taught as a college course I would transfer. A bit slow going at first. The book goes into a lot of background pre-Christmas 1941, and it reads like a college term paper, constantly referring to other works. Once you actually get through chapters 1-5, it starts to pick up, as that's when Churchill actually ARRIVES in Washington, DC to meet with FDR. I am waiting to receive the second half of the book so I can listen to the rest. Hopefully it will continue to get better.